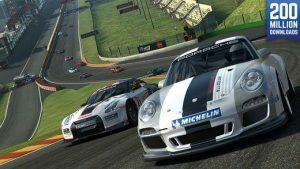 Real Racing 3 is the award-winning franchise that sets a new standard for mobile racing games you have to play it to believe it. Real Racing 3 features an ever-expanding roster of officially licensed tracks with 40 circuits at 18 real-world locations, a 43-car grid and over 170 meticulously detailed cars from manufacturers like Ferrari, Aston Martin, Porsche, Bugatti, Chevrolet, Lamborghini, Mercedes-Benz, McLaren and Audi. Plus Real-Time Multiplayer, Social Leaderboards, Time Trials, night racing, and innovative Time Shifted Multiplayer™ (TSM) technology, allowing you to race anyone, anytime, anywhere. This is a resource-intensive game featuring extremely high quality visuals. Please make sure you have at least 1.5GB of free space on your device. Take the wheel of over 170 intensely detailed vehicles from iconic manufacturers like Ford, Aston Martin, McLaren, Koenigsegg and Pagani, and test your skills on an authentic 43-car race grid – the most epic racing experience on any handheld. Burn rubber on a full lineup of 18 real tracks in multiple configurations from top worldwide locations, including Silverstone, Hockenheimring, Le Mans, Dubai Autodrome and many more. Compete in over 4,000 events, including Cup races, Eliminations and Endurance challenges. Choose from a diverse range of upgrades to maximize your car’s performance. Customize your car with a huge collection of paints, vinyls and rims. View the action from a variety of camera angles, tweak the HUD and fine-tune the controls to your personal preference. Exclusively for the Apple Watch, activate your Team Driver to race events, collect rewards and progress your career. I love everything about the game. The graphics are what draw me in the most though. I can’t deny the graphics. I don’t know how they pulled it off but it’s like every pixel is always in it place. The cars are actual real world cars too not fake little karts like in the kids games. I never thought this type of racing game would actually be for all ages rather than focused on the kids. Now a few flaws are the size in which you need to download every level. If you try to download all of the levels it comes up to 1.3 GB which is a huge amount of storage. I’m sure it’s worth the download wait in the end but I want it as soon as possible so I think the levels should come with the game rather than be a whole separate download to the game. Downloading the game may take longer but it would build up suspense about what you’re going to get out of the game whereas when you download the games you already know what’s coming and you get frustrated having to wait for a bit to make it download.